Contemporary design and lots of windows take full advantage of this lovely home site. 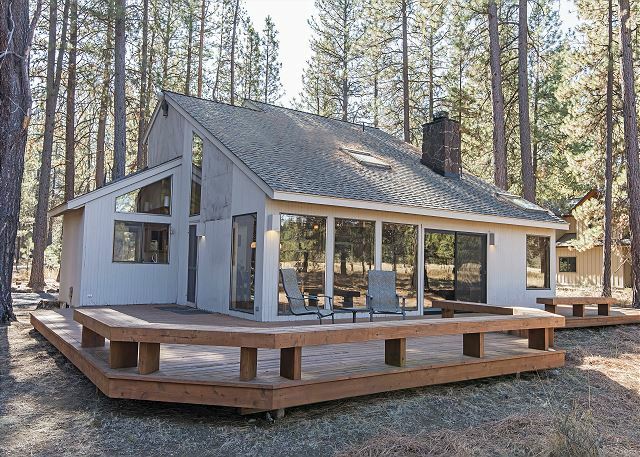 This Black Butte Ranch jewel (GM#188), lies in a quiet area of Glaze Meadow with views of Black Butte, Glaze Meadow and Heron Lake. Your family will love the open, spacious floor plan with the light and bright sunken living area and large fireplace in this spacious 2,001 square foot home. A king bedroom shares a bathroom with a jetted tub with the queen bedroom downstairs. 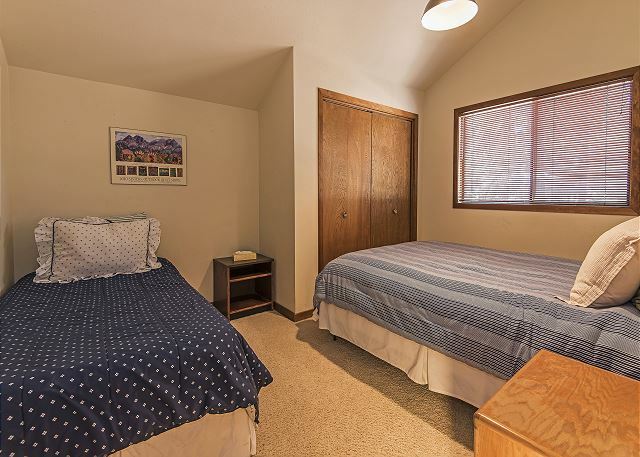 There is one bedroom with 2 twin beds and a second bedroom with a twin and a queen upstairs. These are ideal for the kids, with a shared bathroom in the hallway. A loft upstairs provides a great area for the kids to view movies. This home comfortably sleeps 8 in beds. 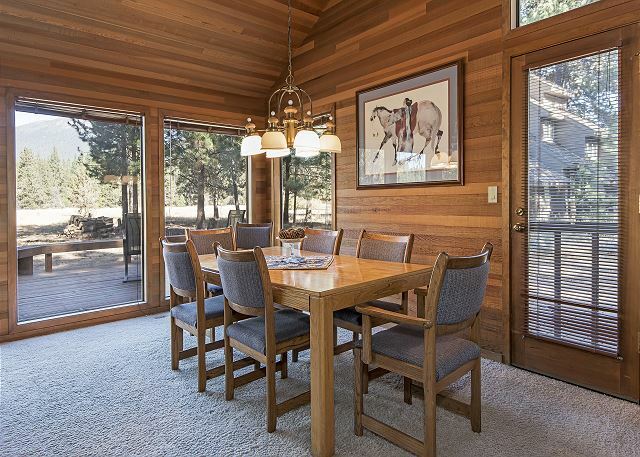 A large dining table in the dining room, plus an eating bar, and a large outdoor table and chairs for outdoor gatherings will suit your every need. A large gas barbeque is available for those evening cook-outs. 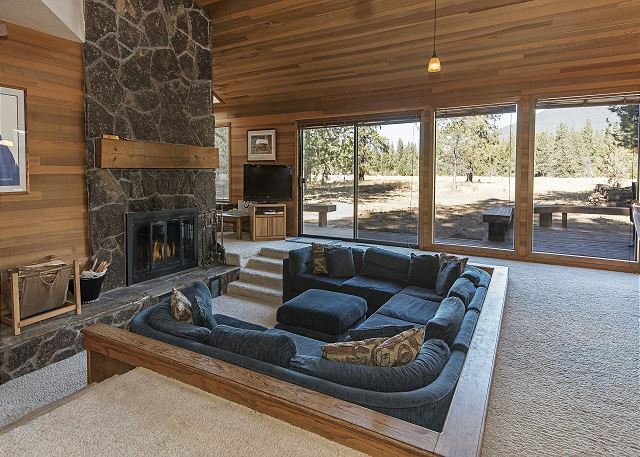 A sunken living room with wrap-around seating in front of the large wood burning fireplace will make for cozy conversations after a long day of fun or provides an intimate area for movie viewing on the wide screen tv. Wireless broadband internet is available to keep in touch with family and friends. 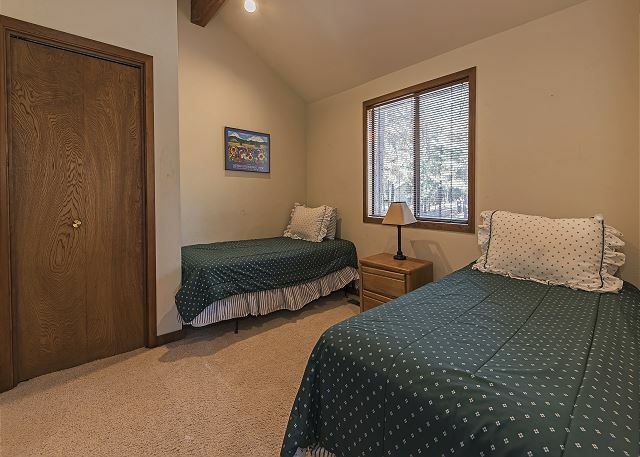 You and the kids will love the flat, scenic bike ride or walk to the Glaze Meadow pool and recreation area just minutes away. Bring your dog along for the fun - this home is dog friendly. 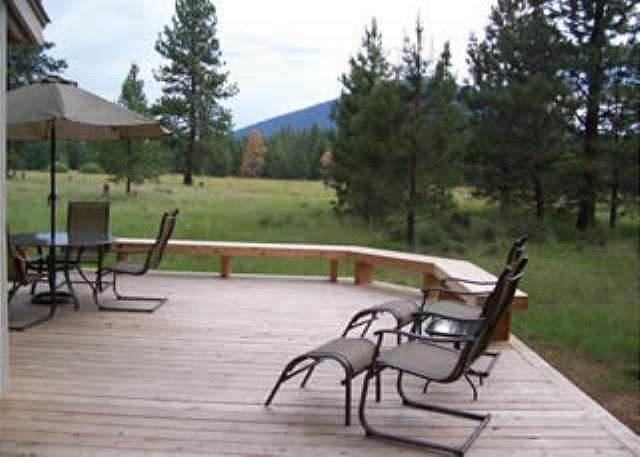 Peace and tranquility will await you after a busy day on this quiet cul-de-sac among the pines. Portable AC's available to rent while supplies are available. This is the fourth time we have rented GM 188 and our overall experience has been wonderful each time. 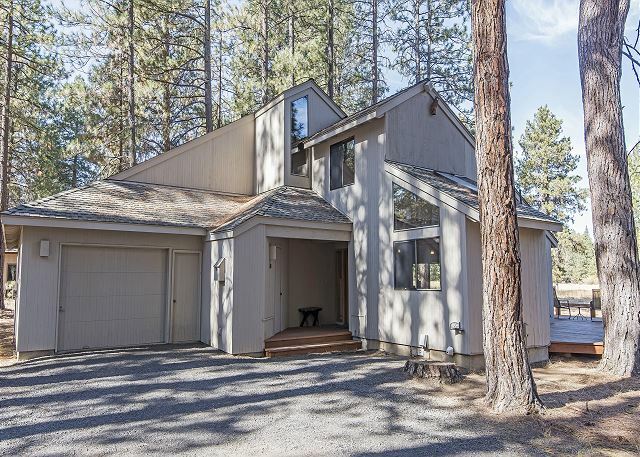 We Love the location as it is quiet, away from the activities at glaze pool, but also an easy bike ride there.the kids love the sunken living room and having a premier view of Black Butte is spectacular. Unfortunately the house continues to show greater wear and tear, especially the old kitchen. This time the dishwasher Was not secured in its position and clunks About when pulling out the drawers and the door is badly in need of some oil. I enjoy working with Jody and sharon and the staff at Howells as they are always super helpful and knowledgeable. 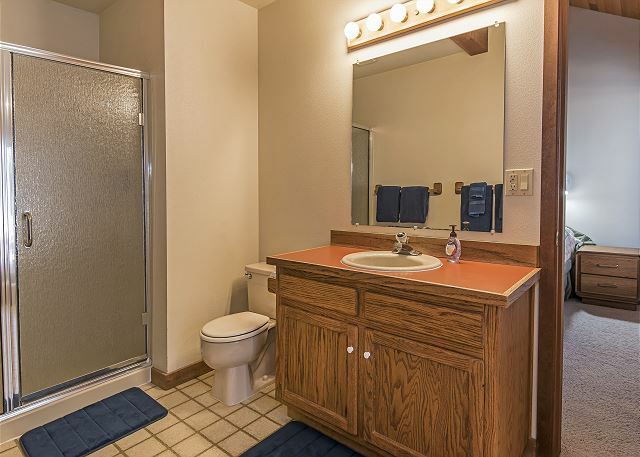 I would only recommend this property to a friend with the above disclaimers and if I were satisfied that there are no other more updated properties available at a similar cost. Whether we continue to rent GM 188 or another property, BBR is a magical place and we will return. We had a lovely time in this home.,The view of the meadow was great and the kids loved the sunken couch. Great for our furry friend - he loved the deck and chasing balls in the grass. 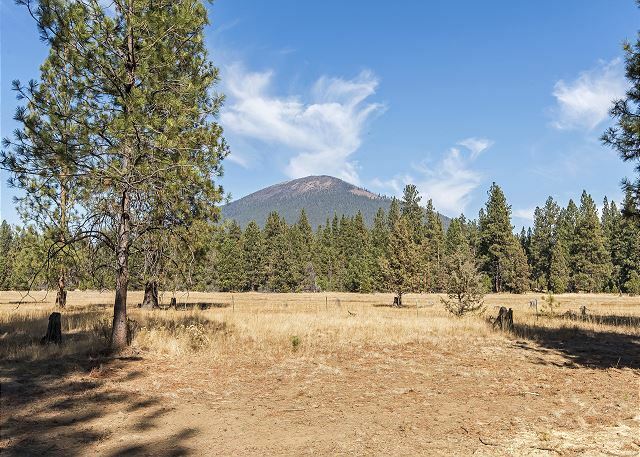 The location cannot be beat - meadow, view of Black Butte, isolation of house. The house was clean, especially the rugs. The space in the house was great. The house does need some major renovations like the kitchen floor. House felt like it was from the 1970s. Being I am in my 70s, I felt right at home. Howell's responded quickly to a problem with the toilet. Had a great stay. Very clean, had everything we needed. Howells was extremely accommodating!